Boo! Are you ready for Halloween yet? Maybe these festive cookies will put you in the mood. If you can see in these photos, the date says “10.19.2007”. 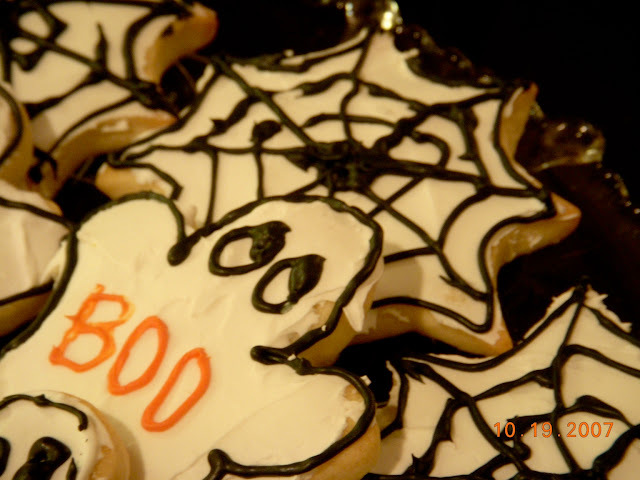 It feels like just yesterday that I made these cookies, not five years ago! Back in October of 2007 I was a sophomore at Texas A&M University (Gig ‘Em!). Since College Station is so close to Houston, I would visit my Aunt Jolene and we would bake literally all weekend long (in addition to watching my little cousins play their Saturday soccer, football and baseball games). Five years ago today, Aunt Jolene and I made these festive Halloween and fall cut-out cookies. I took half of the batch home to my friends at A&M, while Jolene gave the rest with her three grandkids. Aunt Jolene can make, bake and paint just about anything. From homemade wreaths to custom oil paintings to decorated cakes and cookies, she’s literally a Martha Stewart clone! While I love arts and crafts, I’m not one to start a project like this on my own. Arts & crafts take awhile – not to mention all the cleanup involved – and thus you’ll only see me working on projects like these when I have someone to help me. It’s more time efficient and way more fun when you have an extra person around. While these cut-out cookies look hard to make, they are actually pretty simple. The key is to find the right cookie cutter shape. Once the dough is made, you roll it out to about 1/4-inch thick. 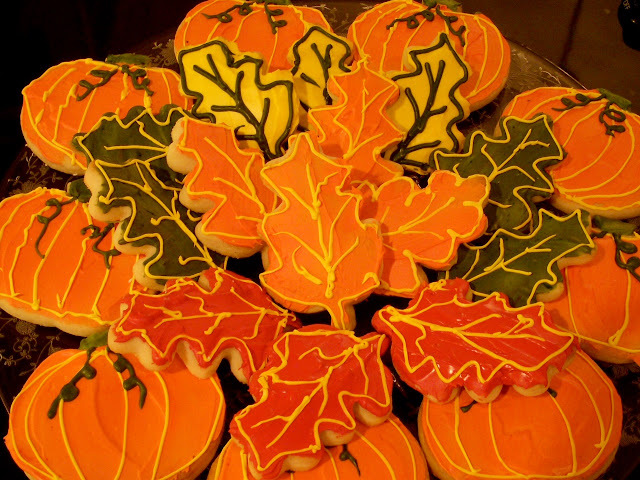 Then, using your favorite cut-outs, create your desired cookies – whether it be cobwebs, ghosts, pumpkins, or festive leaves. Once the cookies have been baked, let them cool completely. The final step is icing them. 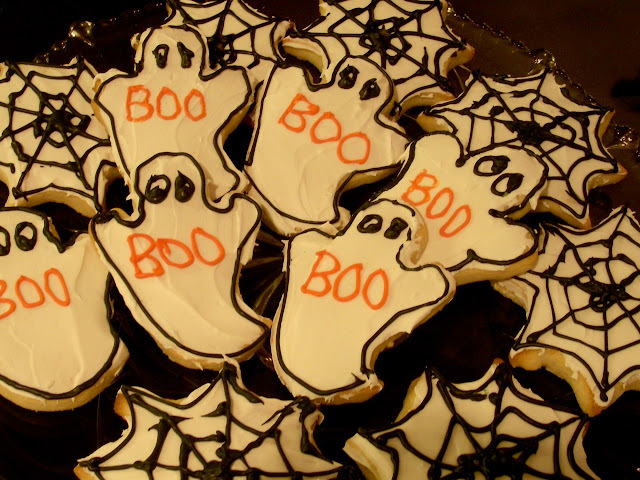 The cobwebs and ghosts were actually the easiest (and prettiest) cookies. Start by creating a fine layer of white icing all over the surface of the cookie. Then, create black and orange icing with food coloring. We placed the icing in small zip-lock bags and cut a tiny hole from the corner of the bag. Using the black icing, simply pipe an outline around the cookies. For the ghosts, you can add black eyes and the letters “B-O-O” in orange. For the cobwebs, we piped two black circles coming out from the center dot. Then we connected the outer points of the cookie to it’s center. Simple, yet elegant! 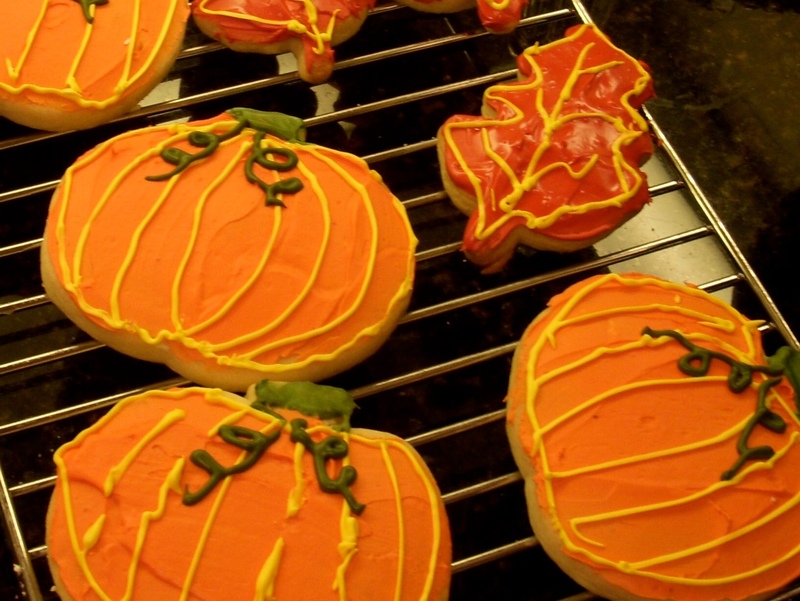 For the pumpkins, use the orange icing to cover the surface of the cookie. For the leaves, do the same with orange, green, yellow or red icing. Next, we outlined each cookie in yellow icing. (Again, pipe it with a small hole cut out from the corner of a zip-lock bag). For the pumpkins, use green icing to great a stem and curly cues coming down. Use the remaining yellow icing (or color of choice) to pipe the veins of the leaves and the lines of the pumpkins. 2. To prepare cookies: Cream the butter and sugar in a mixing bowl until light and fluffy. Beat in the egg. Add the flavorings and mix. Sift the flour, salt and baking powder and add 1 cup at a time, mixing to form a dough. 3. Roll 1/4-inch thick on a lightly floured surface. Cut into desired shapes with cookie cutters. Arrange on an ungreased cookie sheet. Bake for 10 minutes or until edges are light brown. Remove to a wire rack to cool. 4. To prepare frosting: Mix the meringue powder and confectioners’ sugar in a mixing bowl. Add vanilla and butter extract and enough water to make of spreading consistency. Beat until smooth. Add food coloring. Spread on the cookies and decorate as desired. Recipe: from Aunt Jolene – adapted from the Lone Star Five Star: Culinary Creations for Every Occasion (The Junior League of Plano).